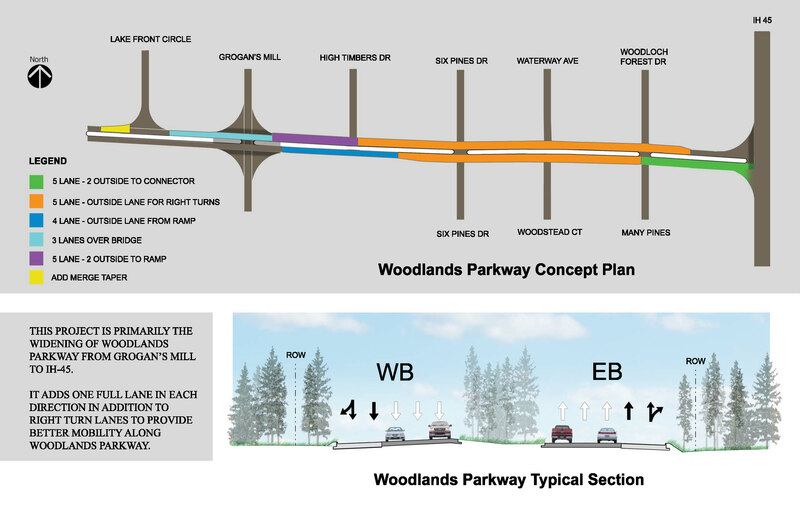 The Woodlands Parkway Widening Project began in February of 2018 and is anticipated to be complete in April of 2019. This project was funded in the Montgomery County 2015 Bond. Woodlands Parkway will be widened from 6 to 8 lanes just west of IH-45 to 0.5 miles west of Grogan’s Mill Road, with additional auxiliary lanes between signalized intersection. SW3P erosion control measures have been installed. Barricades will be placed and all traffic control signs throughout the project will be set. A lane closure may temporarily occur throughout the duration of the project. Nolane closures are allowed from 7 a.m. to 9 a.m. or 4 p.m. to 6:30 p.m. Monday through Friday. If you have any questions regarding this project please contact the Precinct 3 office at 281-367-3977.